Astronomers think this star has too much radiation to allow life to evolve. Astronomers have located a dwarf star that has an extraordinary magnetic field that could be associated with solar flare eruptions similar to the one’s of our own Sun, according to a report on phys.org. The research team used the Atacama Large Millimeter/submillimeter Array (ALMA) to study the cool, dwarf star identified as TVLM 513-46546, which is positioned some 35 light-years from the Earth, and located in the constellation Boötes. Having a mass of about 10 percent of that of the Sun, the star straddles the line between a star, which fuses hydrogen, and a brown dwarf, which does not. The tiny, by comparison to the Sun, it rotates on its axis every two hours, while the Sun takes 25 days to make a complete rotation. However, earlier studies of the star have shown that it produces an extreme magnetic field, perhaps several hundred times as strong as the average magnetic field of the Sun. That fact is causing astronomers to scratch their heads because such a small star should not be able to generate such a magnetic field. 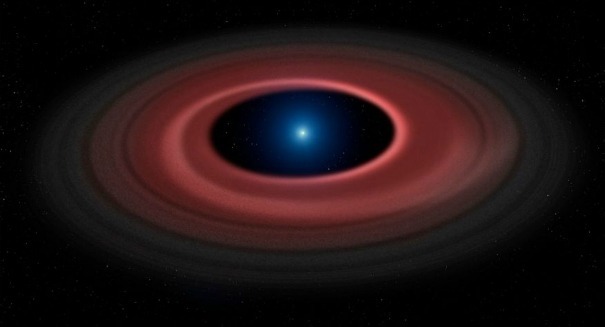 The astronomers are saying this is the first time emissions of this type have been detected from a red dwarf star, and the first time a star like this one has been detected at millimeter wavelengths, which will open a new course of study with the ALMA. Peter Williams of the Harvard-Smithsonian Center for Astrophysics in Cambridge, Massachusetts said we would not be able to have satellite communications around a star like this one, and adds it may have been difficult for life to evolve in an environment such as this. This new information has important implications in the search for planets similar to our own outside of the Solar System. The most common type of stars in our galaxy are red dwarfs, but, since they are so cool, a prospective planet would have to have an orbit close to the central star for liquid water to be present. In this case, such the radiation from the star and the close proximity of a planet would likely lead to the loss of the planet’s atmosphere and loss of any molecules of life on its surface. The astronomers say the plan is to investigate other similar stars to see if this is common or if this new finding is unique. The findings of the study are available online in The Astrophysical Journal.